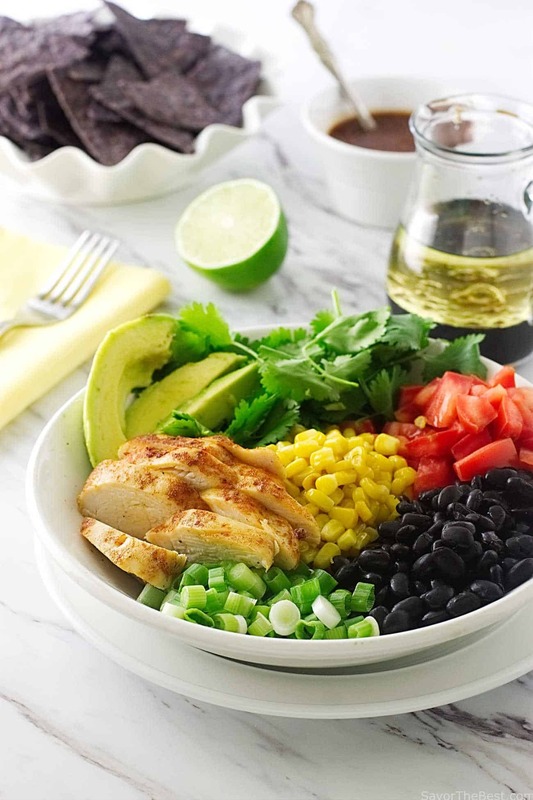 There is a South of the Border taste to our vibrant Southwestern Chicken Salad Bowl. This is a refreshing meal-in-a-bowl salad that is satisfying enough for lunch or dinner. Filled with all the flavors you love, spicy roast chicken, corn, black beans, tomatoes, green onions, cilantro and creamy avocado. 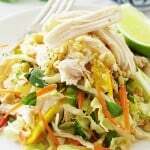 It is topped off with a vinaigrette and served with crunchy blue-corn tortilla chips and a fresh lime squeeze. 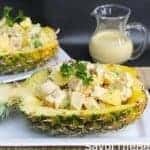 This is a simple salad bowl that is perfect anytime and the ingredients are most likely right there in your kitchen fridge and pantry. Well, maybe you don’t have any blue-corn tortilla chips on hand but if you are anything like me, you will be in the grocery store soon. We don’t see much blue corn now days but it is another one of those ancient grains. It is also known as Hopi maize and is used extensively by the Hopi’s in their culture. Blue corn is one of the oldest varieties of corn, dating back before Christopher Columbus discovered America. Blue corn is grown in Mexico and it continues to be one of the main corn products used in their cuisine. Blue-corn is available in the dried grain but it is also milled into cornmeal, flour and masa as well as products like these tortilla chips. We love the flavor and crunch of these blue-corn tortilla chips in our Southwestern Chicken Salad Bowl. To get the best tasting, tender, juicy chicken breasts we first dusted the chicken breasts with a spice mix of ground chipotle, cumin and paprika then we roasted them in a hot, 450°F oven for 20-minutes until nicely browned. For juicy, moist chicken be sure to ‘rest’ the chicken breasts for at least five minutes before slicing them. This gives all those good juices a chance to settle back into the fibers. Your taste buds will love you for this. We sautéed the defrosted corn kernels in a little butter and seasoned them with salt/pepper and set them aside to cool. The sliced chicken breasts and cooled corn were divided into two salad bowls. 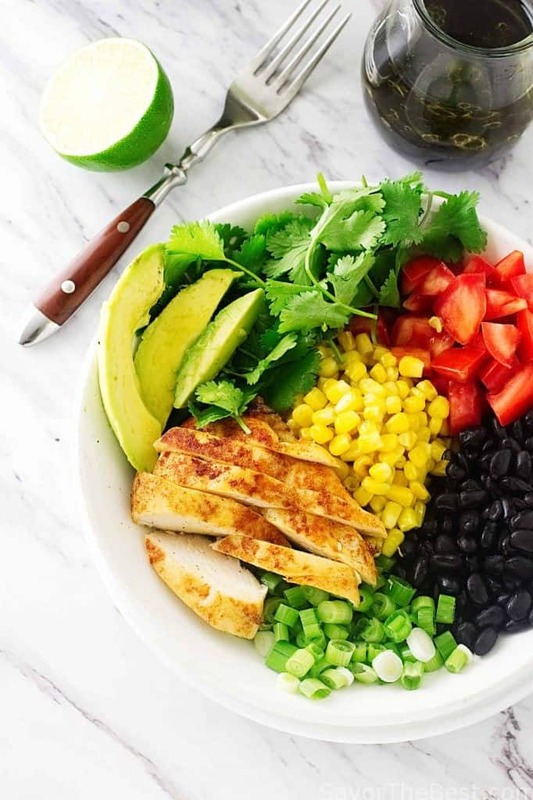 The remaining vegetables of black beans, chopped tomatoes, creamy avocado slices, green onions and a heaping handful of fresh cilantro leaves were added to each bowl. To allow all those flavors to shine through we dressed this salad lightly with just a simple vinaigrette made of oil and balsamic vinegar. The blue-corn tortilla chips were served with the salad as well as a dish of salsa and fresh limes to be squeezed over the top. 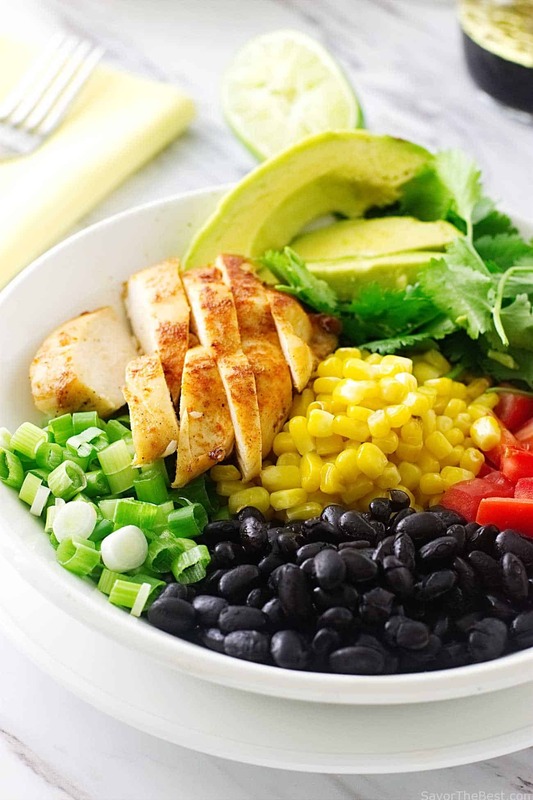 Our Southwestern Chicken Salad Bowl is filled with spicy chicken, black beans, corn, chopped tomatoes, creamy avocado slices, green onions and cilantro. A simple balsamic vinaigrette dressing lets all the flavors shine through. Served with crunchy blue-corn tortilla chips and fresh lime. Dry the chicken breasts with a paper towel and brush them with olive oil. In a small dish, add the chipotle, cumin, paprika and salt whisking together to combine. Dust both sides of each chicken breast and place on a baking sheet. 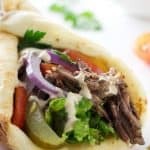 Roast in the preheated oven on the upper third for 20-minutes. Check for doneness using an instant-read thermometer for a reading of 165°F. Transfer from the oven and allow to rest for at least 5-10 minutes tented lightly with foil. Transfer to a cutting board and slice. While the chicken is roasting, add the butter to a small skillet set over medium-high heat and when it has melted add the defrosted corn. Sauté, stirring frequently until hot. Remove the skillet from the heat and allow the corn to cool. 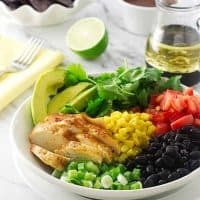 Using two shallow salad bowls, divide and arrange the corn, black beans, chopped tomatoes, sliced avocado, green onions and cilantro. 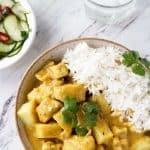 Place a sliced chicken breast in each bowl. In a small Mason jar, combine the vinegar, oil, salt and pepper. Put the lid on the jar and shake well to combine. 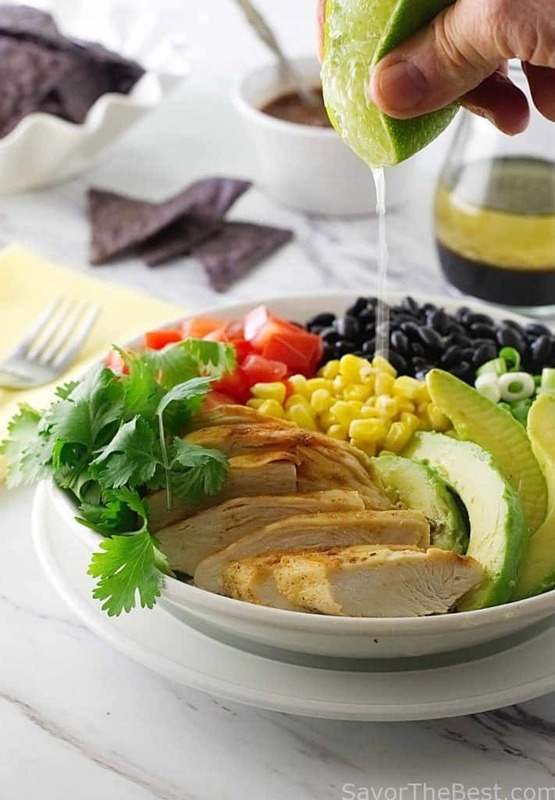 Drizzle each salad with a tablespoon of the vinaigrette and serve with fresh lime halves and a side dish of the blue-corn tortilla chips. Salsa and sour cream could also be served as a condiment. If you like your chicken a little browner, after the 20-minutes of roasting, switch the oven to broil and watch closely, removing them from the oven when nicely browned. About 3-minutes. Our listed nutrition values are for the salad only: The nutrition value for One tablespoon of vinaigrette is 73 calories and 8.4 fat. 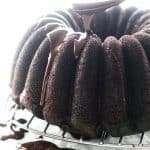 Ive enjoyed getting your newsletter and even trying a recipe or two. 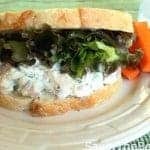 This Chicken Salad in a bowl is one I will definitely try! Thanks for sharing. 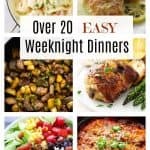 Question: is the cook time really 20 hours? One of my favorite salads! Beautifully done! What a pretty dish! Love all the colors. And the flavors too, of course. 🙂 Great way to serve chicken — love the chipotle. Thanks! Thanks, John….This is a ‘go-to’ salad at our house. The chipotle gives it a little zing. It is also really good with a light chipotle dressing.